Panjam Investment Limited (PJAM) has advised that at a meeting of their Board of Directors scheduled for Thursday, August 16, 2018, the directors will consider the payment of a third interim dividend for the year 2018. Panjam Investment Limited (PJAM) has advised that six senior managers were issued a total of 80,575 PJAM shares under the Employee Share Purchase Plan on July 4, 2018. PanJam Investment Limited (PJAM) has advised that three directors and a related party were issued stock grants under the PJAM Long Term Incentive Plan totaling 1,077,487 PJAM shares. PanJam Investment Limited (PJAM) has advised that a connected party purchased 800,000 PJAM shares on May 22, 2018. 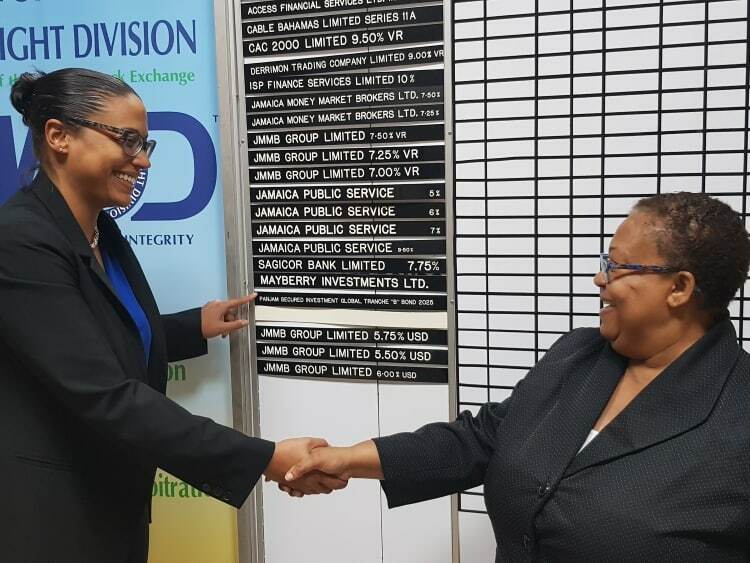 Mrs. Marlene Street Forrest, managing Director, JSE shakes hand with Ms. Joana Banks, VP New Business Development & Strategy, PanJam Investment Limited (PJAM) after inserting the PJAM Bond strip. Panjam Investment Limited (PJAM) has advised that at a meeting of their Board of Directors scheduled for Thursday, May 10, 2018, the directors will consider the payment of a second interim dividend for the year 2018.